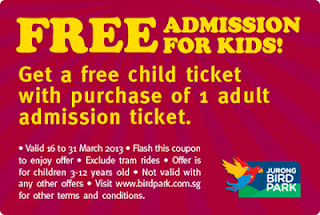 Ticket offer includes one (1) complimentary single day child admission ticket with one (1) full-priced single day adult admission ticket to Jurong Bird Park. Valid 16 to 31 March 2013. Child defined as 3 to 12 years old. Not valid with other discounts, promotions, rebates, or online ticket purchases. Not valid for tour groups, travel agents, school groups, online and SISTIC bookings. 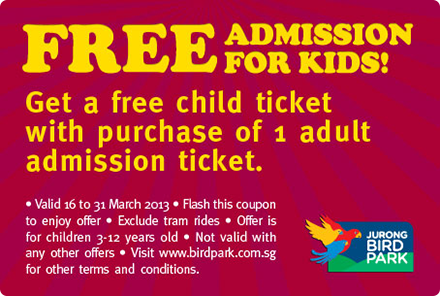 Promotion is only valid for tickets bought over the ticketing counters at Jurong Bird Park. Offer applies to admission on day of ticket purchase.